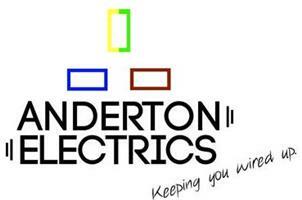 Anderton Electrics Limited - Alarms/Security, Electrician based in Dunstable, Bedfordshire. DOMESTIC OR COMMERCIAL WORK - At Anderton Electrics we're happy to offer any electrical service whether its domestic or commercial. If its a system that we have installed, however big or small, we will naturally be in the best position to suggest and implement an appropriate maintenance programme that you might need. We can, and are contracted by our clients to maintain their existing systems whether this is in new or older buildings. EMERGENCY WORK - We deal with reactive jobs whether its for our maintenance or new customers; everything is dealt with to the same level of priority. We will ensure we attend at short notice and carry out any repairs which are required on the spot after agreement. MORE THAN A QUICK FIX? If the nature of the problem requires extra parts or works to be carried out, we will keep you closely informed every step of the way and help minimise as many disruptions as possible. All this work will be carried out in accordance with BS7671 amendment 3 (2015) as well as keeping costs within your budget. Our business customers prefer to be on a regular maintenance contract because this generally reduces costs in the long run, however we are also happy to work on a price per job basis if required. UPGRADING EXISTING SYSTEMS - Whether you are looking to upgrade your existing system or looking for a complete rewire, we have become invaluable to our customers as we make things happen. We ensure that if its renewal or adaptation we are carrying out, it is done in the least intrusive way possible so you can carry on with daily life as normal as possible. EMERGENCY LIGHTING SYSTEMS - Whatever the size or type of building, we are able to install and test Emergency Lighting systems, either alongside the provision of other fire safety measures or separately. Our experience ensures it is delivered within budget and to your satisfaction. All our work is completed in accordance with BS5266 and the latest BS7671 amendment 3 (2015) as is expected. In addition to conventional emergency lighting we are able to offer LED emergency lighting system, which will significantly lower running costs by as much as 85-90% Whichever emergency lighting system you have in place or decide to have us install, we provide fully managed maintenance schedules to ensure your Emergency Lighting is fully tested and maintained to ensure it functions correctly when required in an emergency and these tests are carried out to ensure the continued protection of the building and its occupants - giving you peace of mind. All our jobs will be completed to the usual high standards that you expect and deserve, keeping to safety regulations to protect both our staff and our clients. ?Looking for something else? Feel free to just drop us a line and we will be more than happy to discuss your needs.